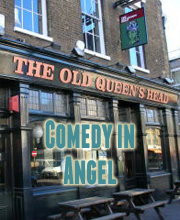 Laugh Out London is back at the Old Queen’s Head in Angel for 2013! We’ll be bringing you another night of alternative comedy to feast your brain on. Expect games, presents and funny people. Doors are 7.30pm for an 8.00pm start. Daniel’s debut hour “Champions” netted him the Edinburgh Comedy Awards Best Newcomer in 2012. Other achievements since leaving his native Norway to pursue his stand up career include winning So You Think You’re Funny (2008), reaching the finals of the Laughing Horse New Act of the Year and supporting Simon Amstell on tour. He also popped up on Russell Howard’s Good News (BBC Three). Surrealist housewife and Radio 4 favourite, Christie is the new forefront of donkey-based feminist humour. She has starred in a number of TV and radio comedies including Cardinal Burns on E4, Harry Hill’s “Little Internet Show”, Sarah Millican’s Support Group, Miranda Hart’s House Party and Dilemma. Her latest show, War Donkey also featured on The Culture Show as one of Sue Perkins’ Top 5 Edinburgh shows and received 10 four star reviews. It was also one of GQ magazine’s Ten Essential Edinburgh shows. The Arts Desk said Bridget had “the best fart joke on the Fringe by a country mile”, which has made her very proud. Pat is well known for his offbeat humour which has seen him win a bag full of awards and even appeared on Chris Moyles’ Comedy Empire (BBC three). Pat has won Chortle Best Newcomer 2012, New Act of the Year (Formerly Hackney Empire) 2012 and The Amused Moose Laugh Off 2011. He was also a finalist for The BBC New Comedy Award Final. He’s a unique and exciting talent. He will bring a game or two possibly. Maybe a joke.